This frame set off a picture of a grove of birches perfectly. 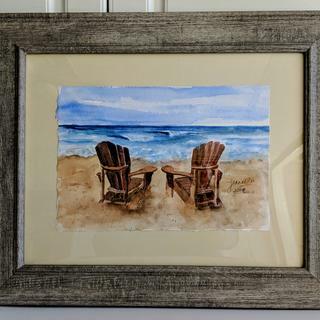 Love this frame, perfect for a beach themed painting. I ordered one 21x31 RST16 frame over a month ago and liked it so much I ordered another 24x31 for another client. The first one was just as shown with different contours to the frame. The second frame rec'd had to be a substitute as it was flat all the way across but I had to get the framing done and to the client, so I had to use it, very dissatisfied that I wasnt even asked if I wanted a flat across frame. Lot of money paid to be so disappointed! Linda we sincerely apologize that you are not pleased with the RSL16 frame. I have reviewed your order history and I see that you did not order the RST16 frame you were expecting to get. That is why the profile is flat versus the contoured style. If you would please give me a call at 1-800-332-8884 I would like to offer you some type of compensation. I can certainly understand that you needed to get this to your client in a timely fashion. Please let me know how we can make this right with you. My clients wanted a rustic frame that was a light grayish and had a bit of a birchy feel. I used this frame for a matted watercolor I painted. It worked perfectly. This time I’m using it for oil paintings of local barns in my area. I like the weathered effect with beach scenes. To frame a pic for my wife's birthday. Wanted a traditional frame in a light, driftwood color for beach landscape paintings. My oil on canvas is beech trees. I think this will set it off nicely. Can I use this frame on a canvas that has a 1” depth? Thank you for your inquiry! The rabbet on this frame is 1/2" meaning your 1" deep canvas will stick out from the back. Some customers do not mind this when the frame moulding is thicker. Take a look at this frame https://www.pictureframes.com/Custom-Frames/Sand-Custom-Frame-BRD5 that has a similar in color and can accommodate a 1" canvas. If you have any additional questions do not hesitate to contact our friendly framing experts at 1-800-332-8884 or via LIVE chat Monday-Friday. I used it for a client last year and as I recall it was not for a canvas. Don't think it will easily take a 1" canvas because it would extend beyond the depth of the frame. But if you were to use offset clips and screws it would work but, obviously, would not be flush with the frame. Hope this helps. I think Pictureframes should be able to assist you further.